A McCain campaign volunteer made up a story of being robbed, pinned to the ground and having the letter "B" scratched on her face in what she had said was a politically inspired attack, police said Friday. Ashley Todd, 20-year-old college student from College Station, Texas, admitted Friday that the story was false, said Maurita Bryant, the assistant chief of the police department's investigations division. Todd was charged with making a false report to police, and Bryant said police doubted her story from the start. Dressed in an orange hooded sweat shirt, Todd left police headquarters in handcuffs late Friday and did not respond to questions from reporters. The mark on her face was faded and her left eye was slightly blackened when she arrived in district court. Todd was awaiting arraignment Friday on the misdemeanor false-report charge, which is punishable by up to two years in prison. She will be housed in a mental health unit at the county jail for her safety and because of "her not insignificant mental health issues," prosecutor Mark Tranquilli said. Todd initially told investigators she was attempting to use a bank branch ATM on Wednesday night when a 6-foot-4 black man approached her from behind, put a knife blade to her throat and demanded money. She told police she handed the assailant $60 and walked away. Todd, who is white, told investigators she suspected the man then noticed a John McCain sticker on her car. She said the man punched her in the back of the head, knocked her to the ground and scratched a backward letter "B" into her face with a dull knife. Police said Todd claimed the man told her that he was going to "teach her a lesson" for supporting the Republican presidential candidate, and that she was going to become a supporter of Democratic candidate Barack Obama. Todd told police she didn't seek medical attention, but instead went to a friend's apartment nearby and called police about 45 minutes later. Todd could provide no explanation for why she invented the story, police said. The woman told investigators she believes she cut the "B" onto her own cheek, but did not provide an explanation of how or why and said she doesn't remember doing so, police said. Police said the woman reported suffering from "mental problems" in the past, and that they do not believe anyone put her up to the act. Tranquilli said Todd will remain jailed over the weekend pending a psychiatric evaluation, which won't happen until Monday at the earliest. The Associated Press could not immediately locate Todd's family. Bryant said somebody charged with making a false report would typically be cited and sent a summons. But because police have concerns about Todd's mental health, they are consulting with the Allegheny County District Attorney. Todd worked in New York for the College Republican National Committee before moving two weeks ago to Pennsylvania, where her duties included recruiting college students, the committee's executive director, Ethan Eilon, has said. "We are as upset as anyone to learn of her deceit, Ashley must take full responsibility for her actions," College Republican National Committee spokeswoman Ashley Barbera said in a statement. 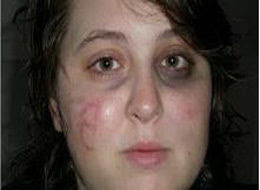 Police reported Todd's claims Thursday, as a photo of her injuries made it onto numerous blogs and news sites. By Friday, police said they had found inconsistencies in Todd's story. They gave her a lie-detector test, but wouldn't release the polygraph results. "They just started talking to her and she just opened up and said she wanted to tell the truth," Bryant said. Police suspected all along that Todd might not be telling the truth, starting with the fact that the "B" was backward, Bryant said. "We have robbers here in Pittsburgh, but they don't generally mutilate someone's face like that," Bryant said. "They just take the money and run." The KDKA reporter had called McCain's campaign office for details after seeing the story -- sans details -- teased on Drudge. The McCain spokesperson's claims -- which came in the midst of extraordinary and heated conversations late yesterday between the McCain campaign, local TV stations, and the Obama camp, as the early version of the story rocketed around the political world -- is significant because it reveals a McCain official pushing a version of the story that was far more explosive than the available or confirmed facts permitted at the time. The claims to KDKA from the McCain campaign were included in an early story that ran late yesterday on KDKA's Web site. The paragraphs containing these assertions were quickly removed from the story after the Obama campaign privately complained that KDKA was letting the McCain campaign spin a racially-charged version of the story before the facts had been established, according to two sources familiar with the discussions. B4B NOTE: We have just received unconfirmed word that Ashley Todd has been arrested. Update coming soon.